Paint chip repair is simple when you have the right products. 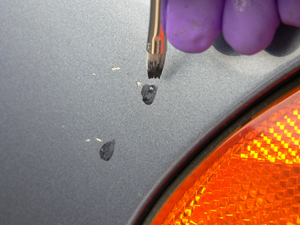 Dr. ColorChip makes excellent paint chip repair kits that render paint chips nearly invisible. A paint chip is characterized by an absence of paint. A rock or debris has literally chipped the paint away. To fix paint chips, you need to fill them with paint and then blend it flush with the surrounding paint. The blending is the tricky part, but Dr. ColorChip makes it easy with their complete paint chip repair kits. Autogeek has several kits designed to fill and repair paint chips and road rash. Road rash is a large number of small paint chips. Road rash often occurs on the hood or behind the tires where rocks are kicked up. Before repairing the paint, make sure the vehicle is clean and dry. 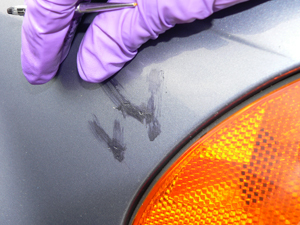 Use rubbing alcohol to remove any existing touch-up paint. STEP 2: Use Dr. ColorChip's blending solution to remove excess paint. Apply the solution to a soft, folded T-shirt rag and lightly rub over the excess paint. The paint will begin blending away after a few passes with the cloth. 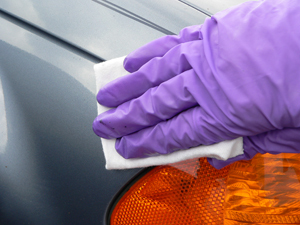 Use a soft microfiber towel to buff off the residual solution to an amazing shine. This process may be done within 2 minutes to 2 hours after applying the paint. Although the paint is dry to the touch, it will still take about a week to fully cure. However, it may be immediately exposed to water without coming out of the chips. After you've repaired your paint with a Dr. ColorChip Paint Chip Repair System, wax after one week. Avoid machine polishing the repaired area for at least 30 days. When you do need to polish, Dr. ColorChip recommends using a random orbital polisher and foam pads for the best results over the repaired area.